I’m back after a three month absence. Whether that’s good or bad is up to you. I’ve been helping Scott Burwell Holloway get his harp guitar company going and this is an example of a Style 8 Dyer Symphony that we completed in January for the NAMM show in Anaheim. First a little background on the instrument. 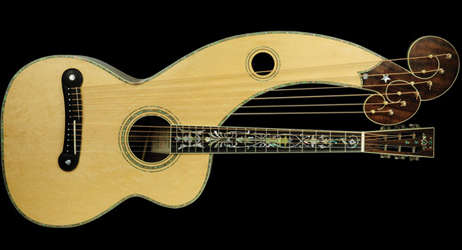 The first “modern” harp guitar was invented by Friedrich Schenck in Vienna in 1839. It was a “hollow arm” harp integral with the guitar body. Schenck was a student of Johann Stauffer, who also taught C.F. Martin. The turn of the 20th century saw a resurgence of harp guitars in the US. Orville Gibson made four models and although they sold for from $194.03 for the style-R to $354.60 for a U-1, 400 were sold. Most people consider Chris Knutsen to be the originator of the American harp guitar. Although it’s similar to the Schenck in that it had an hollow arm it was more integrated into the body. This brings us to the Dyer Brothers, who contracted Knutsen in 1899 to build harp guitars for them. By 1906 the Dyers had switched from Knutsen to the Larson Brothers in Chicago (possibly because Knutsen kept changing his instruments). The Larson’s made very high quality instruments (Prairie State, and Euphonon are two brands) and improved on the Knutsen design giving us the most famous harp guitars made. When I say we made a Dyer #8, it really is a modern Dyer as Scott owns the Dyer name and has committed himself to building faithful copies of their designs as well as what he thinks the Dyers might have done had they taken the harp guitar into the 21st century. Scott is a wealth of information on all things harp guitar and has many historic examples of Knutsen’s and Dyer’s in his collection. He is also a phenomenal concert level player, having studied under the late Michael Hedges and Will Ackerman, founder of Windham Hill Records. As far as I know this is the first time in recent history someone has considered a factory instrument as all the moderns ones are from hand builders. Next week the beginning of the build. This entry was posted in guitar building, Guitar Stuff, Lutherie, Tools and tagged acoustic bridge, acoustic guitar, bolt on neck, fretboard, guitar building, Guitar finishing, Harp Guitar, Lutherie, peghead by Geiger School of Lutherie. Bookmark the permalink.